(4x 1gbe RJ45 ports per ctrl). Dell Equallogic. We buy retired EMC, Netapp, and Dell Storage! Ask for Nick. Specializing in Netapp, Dell, EMC, IBM, HP and many more products lines. Ask for Nick Charles. Trending at $1,992.50eBay determines this price through a machine learned model of the product's sale prices within the last 90 days. 7x 800 Gb SSD 17 x 1.2 Tb 10K Equallogic drives. All components are Equallogic. One array has your primary copy and the other equallogic array has the backup. Equallogic takes care of the sizing based on the RAID level you select. HPE MSA 2050 SAN Dual Controller SFF Storage Q1J01A NEW Retail w/ 3 year WTY! HP Part Number:Q1J01A. Manufacturer Part Number Q1J01A. Looking for affordable, high-performance shared storage?. But do not let the low cost fool you. HPE MSA 2050 Storage gives you the combination of simplicity, flexibility to grow now, and advanced features you may not expect in an entry-priced array. Warranty: Dell 4 Hour On-Site Service, Gold Support or ProSupport with Mission Critical through August 14, 2019. Hard Drives: None Included. Form Factor: 2U Rack-mount Disk Array. Front Bezel: Yes Included. 64TB (16x 4TB 7.2K ) SAS Hard Drives Installed (Bare Enterprise Seagate). 24x 2Tb 7.2K SAS Hard Drives Installed, Dell EqualLogic Enterprise Plus (Tray stickers will be blank). 192TB (48 x 4TB) SAS Hard Drives Installed 7.2K (Bare Seagate Enterprise Hard drives). 144TB (48 x 3TB) SAS Hard Drives Installed 7.2K (Bare Seagate Enterprise or Hitachi Enterprise). ISCSI Storage. 16x 300GB 15K SAS Hard Drives Installed. Tested and reset back to factory defaults. 24x 2.5" SAS Hard Drive Slots. 2x Power Supplies. Boardroom Technologies will provide top level service and will do everything in our power to satisfy all your needs. 24x 2.5" SAS Hard Drive Slots. Boardroom Technologies will provide top level service and will do everything in our power to satisfy all your needs. 2x Power Supplies. 16x 450GB 15K SAS Hard Drives Installed (Generic Enterprise Hitachi). ISCSI Storage. 24x 2TB 7.2K SAS Dell EqualLogic Enterprise Plus Hard Drives Installed (48TB Total). 48 x 3TB 7.2K SAS Hard Drives Installed (Bare Hitachi Or Seagate). Part number : JFW1P. Manufacturer : DELL. With over 50 years of experience in the IT hardware market, Rhino Technology Group is positioned to provide a cost effective, custom IT solution for any need that may arise. All components are Equallogic. (12) Equallogic 600 Gb 15K drives mounted on 3.5" trays. (2) 700 watt Equallogic power supplies with power cords. Unlike our competitors you will be receiving Equallogic drives. 1x EMC V2-DAE-12 Expansion Chassis. Dell EqualLogic Branded Drives Installed! (per ctrl 2x 1gbe RJ45). Dell Equallogic. 12x 2TB NL SAS 3.5" LFF Dell Orig. We buy retired EMC, Netapp, and Dell Storage! Ask for Nick. Specializing in Netapp, Dell, EMC, IBM, HP and many more products lines. 16x SATA Trays With Interposer Included! 7x Equallogic 400GB SSD 2.5" Hard Drives Installed PN: WMWPW. 17x 600GB 10K SAS 2.5" Hard Drives Installed. 10.2TB HD / 2.8TB SSD Installed. Genuine Dell PowerVault MD3660i 10GB iSCSI Controller 3.5" SAS 59F69 059F69 Brand: Dell Part Number: 59F69 MPN: 059F69, CN-059F69 Type: Raid Controller To Fit: 3.5" SAS Hard Drive Storage Arrays: iSCSI 1 Gbps Ethernet SAS Connector: One SAS OUT port for expansion to an additional PowerVault MD3060e expansion enclosure iSCSI Connectors: Two 10 Gbps iSCSI IN connectors to connect hosts Serial Connector: (debug port) One 6-pin mini-DIN connector Management Ethernet Connector: One 100/1000 Mbps Ethernet connection for out-of-band management of the enclosure Power: AC power supply (per power supply) Wattage: 1755 W Heat dissipation (maximum): 5988 BTU/hr Voltage: Battery: 6.6 V DC, 1100 mAh, 7. Barebones Chassis. Dock or forklift?. Manufacturer: Dell. Up to 48 SATA Hot-pluggable Hard Disk Drives. Condition:New Other. There are a few small marks on the top of the chassis from handling. Residential area?. Nexsan E18 8GB FC SAN. Serial Cable. Dual Power Supplies. 12 x 3.5" Hard Drive Tray. No Hard Drive . Wiped and ready to go, I have two for sale. HP Part Number:Q2R25A. Manufacturer Part Number Q2R25A. Need a modern shared storage array which is flash-ready when you are and affordable with what’s left of a small budget?. The HPE MSA 1050 SAN Storage features iSCSI, FC and SAS host interface connectivity at previously unattainable entry price points. Dell Equallogic. 24x 300GB 15K 2.5" SFF SAS DELL EQL. We buy retired EMC, Netapp, and Dell Storage! Ask for Nick. Specializing in Netapp, Dell, EMC, IBM, HP and many more products lines. We provide turnkey solutions for all your needs. The unit power on, all the HDD were wiped and 4 were replaced due error in the disk. Southeastern data has over 22 years experience! No further test was done due limited knowledge and resources. LEDs in front of the unit when starting all turn green and after few minute 2 turn READ the RAID and BATT. Nexsan E18 8GB FC SAN. 18TB (18 x 1TB) hard drives installed. Dual Power Supplies. Boardroom Technologies will provide top level service and will do everything in our power to satisfy all your needs. All components are Equallogic. (24) Equallogic 600 Gb 10K drives mounted on 2.5" trays. (2) 700 watt Equallogic power supplies with power cords. All components inculding the hard drives are Equallogic. Dell EqualLogic PS6110X 24x 2.5" SFF Hard Drive Option 24x 900GB 10K SAS 6Gbps Hot Swap Drives 2x Type 14 Controllers 1x 10GB RJ45 1x 10GB SFP Port 1x Mgmt Port 2x 700W Power Supplies Rail Kit Included Front Bezel Included 2x Power Cords, & 1x Console Cable 2 Year NBD Parts Replacement Warranty. This item is tested and is in good working condition. Dell PowerVault MD3220i Storage Array. 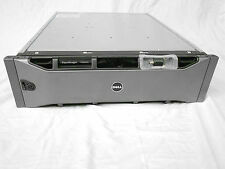 · Dell PowerVault MD3220i Storage Array 2U Chassis. · 14 x Dell 2.5" HDD Hard Drive Blank Filler Installed DP/N – 0TW13J. (12) Dell 6TB 7.2K NL-SAS 12G HDDs (72TB Total). 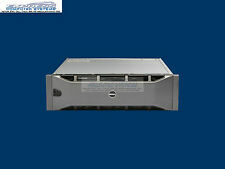 Dell PowerVault MD3200i. Specializing in Dell, NetApp, Cisco, EMC, EqualLogic and HP. We provide turnkey solutions for your Dell needs and all necessary cables, rail kits, and power cords you need to complete your installation right away. 1x NexSAN SataBeast SAN Storage System SATA FC iSCSI. 2x 4Gb Contollers. Dual iSCSI ports. 42 SATA device channels. 2x Power Supplies. Weight: 72.5 lbs (without disk drives). 42 - 3.5" HDD Capacity. Internal Device Interface/Channels. 4TB Installed. 16x 250GB SATA Hard Drives Installed. All components are Equallogic. Equallogic takes care of the sizing based on the RAID level you select. 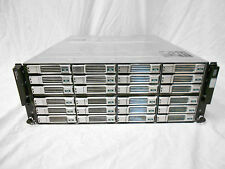 (16) Dell Equallogic 3 Tb 7200 rpm NL-SAS 3.5" drives mounted on 3.5" trays. Drives are Equallogic 7200rpm NL-SAS interface drives.